Melland High School, a specialist SEN school in Manchester, welcomed Career Footsteps. Volunteers, who took a range of vocational routes into the world of work, were welcomed to Melland High School. Students from year 7 to 14 had the opportunity to ask them questions about their careers and the route they took to get there. 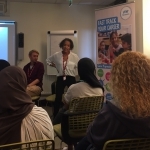 On Friday 13 July, students from Central Foundation Girls' School, Lilian Baylis School, Fulham College and Harris Academy South Norwood were provided with the opportunity to talk to both the Education and Employers and London Early Years Foundation (LEYF) teams about apprenticeships. 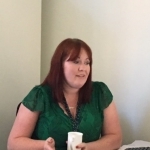 The morning consisted of talks about apprenticeships, and an introduction to the apprenticeships available at LEYF. 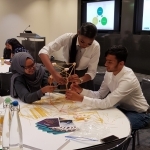 In conjunction with CBRE's Multi-Cultural Network, 20 year 10 to 13 students from BAME backgrounds were recently given the opportunity to gain a more in-depth understanding of what apprenticeships are, as well as a broad introduction to careers at CBRE. 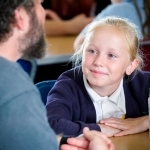 Wednesday 11 July saw the official launch of Inspiring the Future of Theatre at Northstead Primary School in Scarborough. 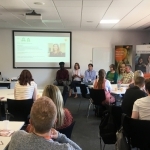 Staff at GlaxoSmithKline (GSK) recently welcomed 30 students from three different schools to their offices in Ware for an event designed to give the students a more in-depth understanding of what apprenticeships are. 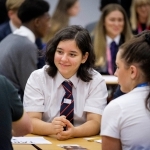 This event was ran as part the Apprenticeship Support and Knowledge for Schools project (ASK), a project to increase the awareness and understanding of apprenticeships. 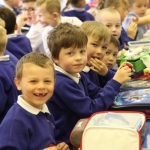 Education and Employers is the delivery partner to London and the South. 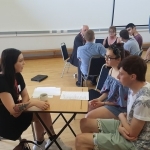 In a summer term full of Career Footsteps events, the next school to welcome volunteers from the world of work was Sandbach High School and Sixth Form on 27 of June. This event consisted of four workshops from professionals from several different fields with one thing in common: they have all taken a vocational path to success. 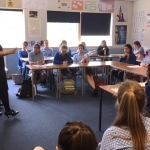 The students at Beaconsfield High School were treated with a packed day of enterprise and career based workshops with Career Footsteps on Tuesday 19 June.